Note: little Shirley passed away on 15 August 2005. 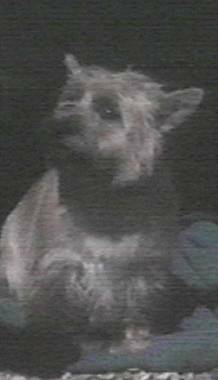 Shirley was one of a litter of puppies belonging to the family that owned the mansion where Grace and Favour was filmed. (To this day, Wendy wishes she'd gotten at least one more of the other of the same litter.) In an 1999 interview (EE:FF), Ms. Richard spoke at length about her Shirley. 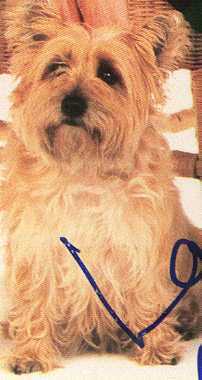 In the 1995 book Celebrity Pets, Shirley was featured among with other "cats and dogs who befriend the famous". Wendy described her as a "true and loyal friend" -- despite being a bit of a terror to garden plants and anything that can be chewed. On the My Pet Stop website, there is a great response by Wendy (go about halfway down the page) to the question as to whether she and little Shirley look alike: "Yes, we're both good looking blondes with expressive eyes, good legs and sparkling personalities!" If you want to see more photos of Shirley, read more about her, and even peruse SB's very own editorial column, stop by Wendy's official website and click on "Shirley's pages".